English/American living in St. Louis, USA. Read, write, knit, spin, weave, karate, geek, science. It’s an odd yarn, four thin strands of cotton, totally unplied, which will make lace knitting difficult. This will need to be used on a simple pattern. I’m wondering how the colour changes will occur because I’ve seen comments that the strands are just knotted together and I don’t want to deal with eight knots per skein, even small ones. I’m concerned. 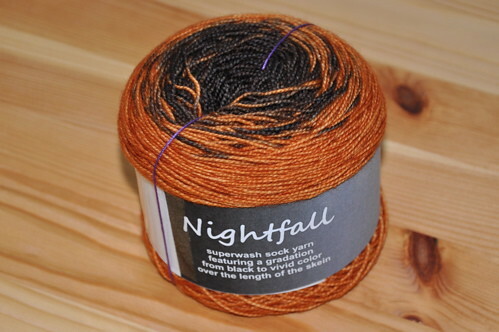 Also got a July pre-order of Nightfall yarn from FibroFibers for a future small shawl, it’s 490yds of merino sock weight in Copper. The yarn is dyed so that one end is copper, the other end is black, and it shades from one to the other over the whole skein. You can also get sock sets that do the same thing over a half skein. Jen the dyer donates $2 from every skein to fibromyalgia research. 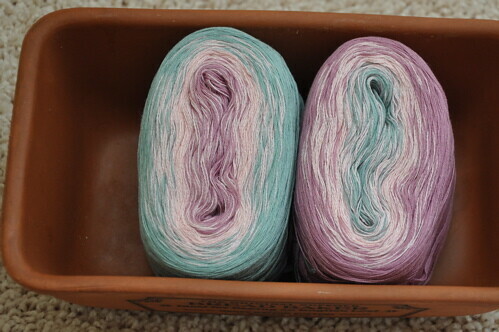 I’ve been eyeing this yarn for months and I’m looking forward to using it. The black in the middle of my skein is very dark brown, like 80% cocoa chocolate. I think I must firmly be in the midst of my spring/summer to fall/winter anual color switch because when I saw that copper Nightfall I actually gasped! So pretty! I”ve been looking at similar yarns, and I can’t wait to see what you do with it! Gasped is a good word for it! Unbelievable! Can’t wait to see how it looks done up. Sometimes I am afraird to make some thing up because I am not sure it will be as pretty in the finished product as in the skein! Previous Previous post: 15th wedding anniversary!